The following deadlines supersede information contained on the University of Kentucky Graduate School website. *Note: International students should submit application one month prior to the date(s) listed. You may establish an account here. Depending on the program you’re interested in you may need different things. These are called program specific requirements. This may include a curriculum vita, personal statement, writing sample or an assistantship application. The documents required for our programs must also be uploaded to the application. Please visit the Admissions section of our Degrees page to see the required information for the program you are applying to. Request a copy of your official Transcripts: You will be asked to upload copies of transcripts (official or unofficial) from all higher education institutions attended and, in the case of domestic students, to self-report cumulative GPA’s for each institution. If you are offered admission and decide to enroll you will then be required to submit official transcripts to the Graduate School. You may also choose to use the National Student Clearinghouse, which most institutions send transcripts securely through. Determine who your recommenders will be. Most EDL programs require 2-3 letters of recommendation. As part of the application you will be asked to supply contact information for the number of recommendations required by your program. Once your application has been submitted, the system will contact each person identified and their recommendations will be submitted directly to us. 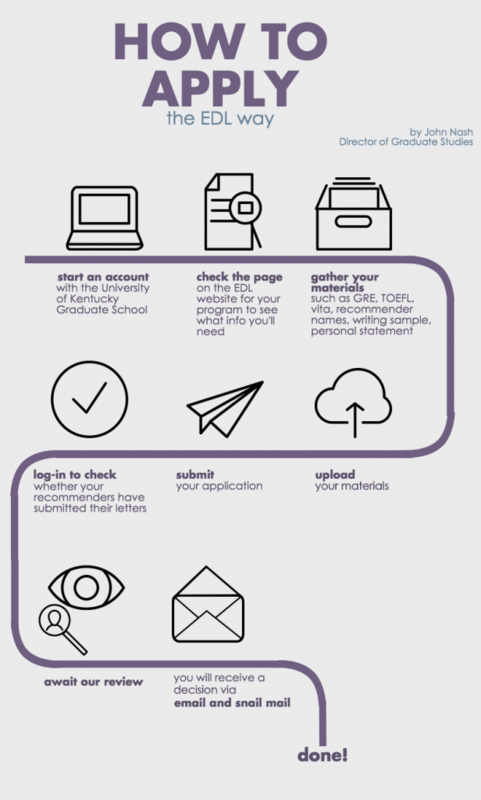 You can check back into your application at any time to see who has submitted a recommendation. Have your GRE scores on hand, if required. Educational Leadership Studies requires that applicants submit current GRE scores for admission to its doctoral degree programs. Applicants will be asked to self-report these scores on the application (you can also supply a future date for taking the test). We will however also require official scores from the ETS or another method (verification of scores from another postsecondary institution on official letterhead). GRE scores should be sent directly to us from Educational Testing Service (ETS); the Institution Code for the GRE for UK Graduate School is R1837.These scores will be incorporated into your application and compared against self-reported scores to ensure consistency. GRE Preparation: UK’s Academic Enhancement offers a GRE prep course open to all students interested in taking the GRE, non-UK students and individuals not currently enrolled in school are also welcome to attend. The GRE Prep Course explores the math and verbal portions of the exam through 4 hours of instruction and practice. The cost of the GRE prep course is $100 for math and $100 for verbal. A combined Verbal & Quantitative score of 1000 (old GRE scale) or 300 (new GRE scale). Analytical Writing: 4.0 or percentile rank of 49. Verbal: 460 (old GRE scale) 151 (new GRE scale) and percentile rank of 49. Applicants to the Ph.D. and Ed.D. programs in EDL must understand statistical concepts, the associated reasoning and critical thinking skills with those concepts such that they are prepared for our programs advanced quantitative courses. Therefore, applicants to the Ph.D. and Ed.D. programs in EDL must demonstrate proficiency in basic statistical concepts and techniques that constitute the foundation of quantitative research. Applicants may follow one of two ways to accomplish this. Complete EPE 558 or EDP 558 before August 15th of the year of admission to EDL. Increasingly, EPE 558 and EDP 558 are being offered online. Applicants and students should check with those departments to determine offerings each semester. Contact the EDL Director of Graduate Studies for other options. All applicants whose native language is not English will be asked to self-report one of these scores on the application. For the Graduate School, the minimum acceptable TOEFL score is 550 (paper-based) 213 (computer-based), or 79 (internet-based). The minimum IELTS score is 6.5; individual programs may however have higher requirements. TOEFL scores should be sent directly to us from Educational Testing Service (ETS); the Institution Code for the TOEFL for UK Graduate School is R1837. Submitted scores must be no more than two years old. Please note that the language score for international applicants who have received a degree from a U.S. institution is waived. All materials gathered must be uploaded in electronic format to the online application system. If you have any questions about UK’s online application process to Graduate School, you may either send an e-mail to grad.admit@nulluky.edu or call either 859.257.9390 or 859.257.4905. Once you have uploaded all the required materials and set up your recommendation requests you can pay the application fee and submit your application. You may log in to your application at any time to check on the progress of your recommenders.